Imperforate, white wove paper, no watermark, engraved. † Scott, Gibbons and Yvert & Tellier all identify colour variants and shades in the first issues. All issue quantities are approximate. Stamps were burnt between April 18, 1861 and sometime (early) 1863. B. CALIFORNIA * 360 CAMPECHE 4,440 C. BRAVOS ? Districts marked with * indicate that no surviving stamps are known. To prevent stolen stamps from being used, the stamps were distributed to the postal districts (administraciones) without overprints. Upon arrival but before being distributed to the sub-offices or sold to the public, they were hand stamped with the district name. Some of the smaller districts did not follow this practice, and there were instances where stamps were used without overprint from even some of the larger districts. 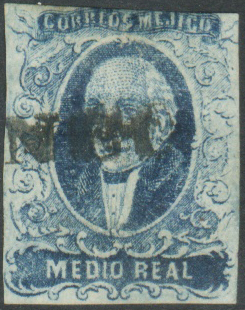 It is unknown whether Baja California overprinted the stamps or not. Districts that did not overprint the stamps can only be identified via the cancellation. The ZACATECAS district name is also found in manuscript overprint. It is a little known fact that Mexican law required businesses to save their correspondence indefinitely. This is why Mexican first issue stamps are relatively common on the market despite their fairly small issue quantities. You can read more about Mexico's first stamp in First Issues vol. 1 #3 p4, vol. 1 #4 p4 and vol.7 #4 p1. Mexico Elmhurst Philatelic Society International (MEPSI) will get you started on collecting Mexico.